This article explains some common reasons for the connector failing to connect to your SIMS - the final step of the installing the Connector. For issues with proxy configuration and connecting to the Platform, please see the install guide. Is SIMS installed on the machine? SIMS .net must be installed on the machine for our connector to make contact with your data. If it isn't, please find another suitable server to install our software on. Do I have the Hostname and Database Name correct? The easiest way of checking this is by locating the connect.ini file, normally sat in C:\SIMS. If your SIMS is installed on a shared drive (such as the S drive), then you will have to look in S:\SIMS. Open up the Connect file in notepad and check the "ServerName" (or Hostname) and "DatabaseName" here match up with what you've entered on the Assembly Configuration tool. Is the Username and Password correct? 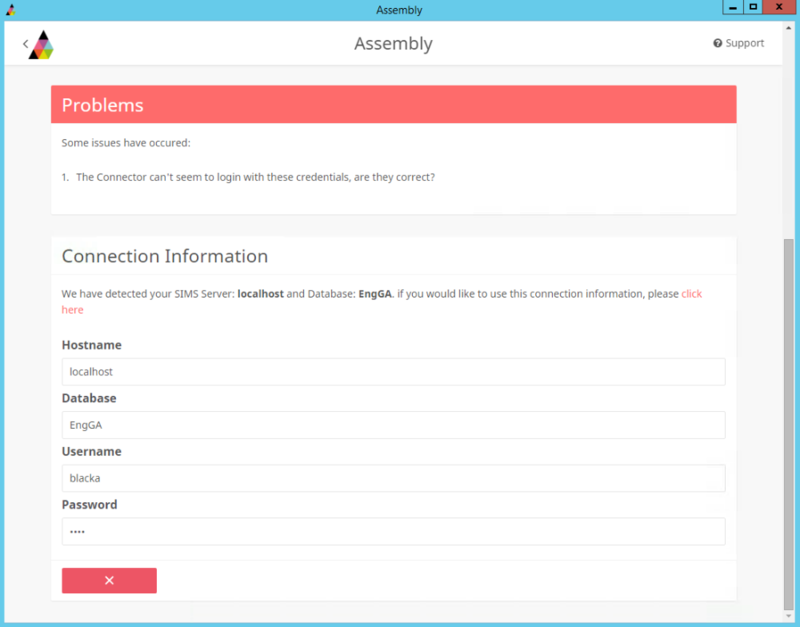 Please see this support article for more information on how to check the permissions, username and password of your Assembly SIMS account. Does the server need rebooting after a SIMS update? After installing a SIMS update, the machine may sometimes need rebooting in order for us to make a connection. Please contact help@assembly.education if you have any questions here.